Mohawk Lifts > News > Considerations when buying a two-post lift: Features to look for when making a purchasing decision. Two-post lifts range in capacities from 6,000 to 30,000 lbs. It is important to note that while the full weight of the vehicle may fit these parameters, it is critical to determine if the weight is distributed evenly. For instance, the bulk of a work truck load may be at the rear of the vehicle while the lift is raised. While some like the convenience of driving on a four-post, scissor or parallelogram lift, when comparing the amount of shop space needed for these lift types, a two-post lift takes up less space. Additionally, given so much work is done with the tires hanging free, there’s no need to also purchase optional wheels-free rolling jacks for tire and brake service for a two-post lift. Next, consider the wide-open work spaces under a two-post lift versus a drive-on lift, as the runways for drive-on lift s always seem to be in the way when replacing brake lines and other under-vehicle components. A two-post lift has no under-vehicle obstructions. Regardless of lift type, adhering to safety guidelines is critical. Many, but not all, lift manufacturers opt to become members of the Automotive Lift Institute (ALI). ALI members must meet the one and only nationally recognized safety standard for vehicle lifts. To verify a lift meets ALI standards for safety, look for a gold ALI certification label affixed to the lift itself. Two-post lifts range in capacities from 6,000 to 30,000 lbs. This does not necessarily mean the full weight of the vehicle is always distributed evenly. Sometimes the bulk of the load will be at the front or rear of the vehicle when the lift is raised. For instance, if you service Ford F-450s loaded with a welder, tools or a one-man bucket the truck may weigh 11,000 lbs, but more than half the weight is in the back half of the vehicle. If the rear axle weighs 7,800 lbs, not over-loading the swing arms is a critical safety issue since no individual arm of any two-post lift is made to lift more than one quarter of the total lift’s rated capacity. In the 7,800-lb rear axle weight example, each of the rear two arms is holding 3,900 lbs. Multiplied by four lifting arms, that means a lift with a minimum capacity of 15,600 lbs is needed. Always know the weight on the heavy end of your service trucks. Design and construction Lifts were once all made from forklift C-shaped channels, to replicate the design similar to how forklifts go up and down several hundred times a day. Years ago, some lift manufacturers changed to a much lighter design and went away from forklift mast type-C with sealed roller bearings design. There are several manufacturers using the lighter design methods, as well as manufacturers that still design lifts with the traditional C-shaped channels. In addition to column construction, review lifting function. There are a number of options available on vehicle lifts, including direct-drive lifting, chain lift ing or cable lifting. Like the example of column design, direct drive lifting eliminates the all-too-common wear of a cable lift. Worn cables and cable pulleys cost shops in the form of bay downtime, service calls and cable/pulley replacements every few years. The construction of the lifts being considered relates to the manufacturer’s warranty. Like anything, a better made machine lasts longer. In the two-post lift business we have seen warranties as long as 25 years, and some as short as one year. In a conversation with the nation’s largest independently owned tire store chain, Les Schwab, we learned their philosophy was to spend more upfront and purchase lifts that last “forever.” Les Schwab has over 450 stores in the western U.S. “Because some stores are so remote, we don’t expect a service man to be available in an hour, so we buy lifts that never cause us problems,” said Rick Martin, manager, shop equipment, Les Schwab. It’s been said 1,000 times: never use a jack without a jack stand. Lifts are no different, and should always be lowered onto the mechanical safety locks. But how do you know if your techs have lowered the lift onto the locks? The answer is a pressure gauge calibrated to the vehicle’s weight, also known as a weight gauge. If the weight gauge reads zero, your techs are properly using the lift. The weight gauge can also provide validation of service. 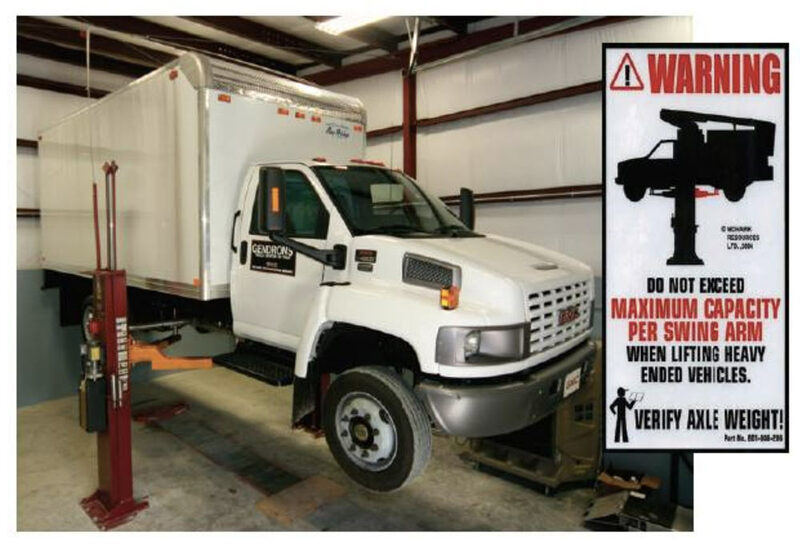 If a customer comes in concerned about a bad tune-up, or the vehicle pulling, you can place the vehicle on the lift to show the actual vehicle weight. Finally, a weight gauge can assist shops with analyzing parts usage. With a weight gauge, you can show the vehicle owner of a 1-ton truck how much his truck really weighs when your service records show the installation of less expensive brake pads. Better tires or brake pads as well as load levelers versus shocks help your shop evaluate the parts used on vehicles. A weight gauge can be the “show and tell” to validate the need for better components. The right two-post lift can help make your shop more productive and more profitable. Prior to your next lift purchase, investigate the differences in lift brands, how they’re built, the warranties offered and the components they’re built from. With this additional research, the next lift purchase decision becomes one you’re proud of rather than regretting in a few years.